As his book designer, I was really impressed by the way Larry Jacobson pursued his aim of getting his book into print. The Boy Behind the Gate tells the incredible story of how Larry sailed around the world along with the companions who shared the journey with him. It’s a generous and moving book, and I asked Larry to share what he had learned along the way. Here’s his story. Six years sailing around the world. Three years writing about it. Sometimes I wonder which was more difficult. About a third of the way into my trip, I decided to write a book. Fortunately for me, I had been and continued keeping my ship’s logs and personal logs. I also had hundreds of emails back and forth with friends and family. All of this documentation left with me nearly 2,000 pages to work from, and I was truly overwhelmed. Like leaving the dock not knowing the destination, you still have to untie the lines and go. So I started writing my book. It was an enormous task that frustrated me, nearly drove me crazy, and cost me nearly $40,000 by the time I had a product in hand. The result is an absolutely stunning new book called, The Boy Behind the Gate and I’m proud to say it’s being received by readers beyond my expectations. Now it’s time to share my experience with other future authors. There are many aspects to publishing that authors and future authors will want to consider before, during, and after their writing. I break these down into different categories. To recount my adventures and summarize six years into a readable format to share with others. To inspire others to make their own dreams come true. Vision of what your book will look like—What was my vision? Originally, I had visions of four-color pages throughout, gorgeous varnished pages, hundreds of photos in a coffee table size book. I ended up with a standard 6″ x 9″ book with two 16-page inserts of four-color photos. Why? Not because of printing costs. My quotes from China were inexpensive enough, but because, after my research and reviewing of many books, I realized that coffee table books are in general, not read. They tend to sit on coffee tables and occasionally people pick them up to look at the photos. I wanted my story to be read because I wanted to inspire people. I knew my words were worth reading. I went with a traditional book adding the spice of a custom map showing our route around the world, mini maps at the beginning of each chapter, and inserted color photo pages. I always wanted a hard cover book from the beginning. Why? To me, that just seems like a book. I’m probably old-fashion in that sense, and plenty of people advised me to go paperback, but I had to stick to my guns with some things and this was something I felt strongly about. On the other hand, I’m happy to have my book on Kindle and the iPad, so I’m getting with the high-tech wave too. After all, a sale is a sale, and if someone reads my book…in any format, and gets any inspiration or joy from it, then I’m happy. What vision do you have of your book? What parts are you willing to be flexible with if budget or other factors test that vision? Editing of the manuscript—I have always enjoyed writing but knew I had limitations. Be smart enough to know what you don’t know. I hired a professional editor and we worked together for almost two years on three very intense edits/revises/re-writes. By the time we were though, and $8,000 later, I considered my book done. He was right. The manuscript was in dire need of help: from grammar, repeated words, unclear sections, and lack of consistency in number usage, capitals, italics…the list went on. Another year and another $8,000 and we had a winner. The writing is clean, tight, concise, and moves the reader forward with suspense, humor, and emotion. The descriptions of places and characters are short and delightful, and the book is getting rave reviews. I was too close to the manuscript after those first two years to have the ability to distinguish the good from the bad. Additionally, my manuscript was too long and because I felt so personal about each and every story that was in it, I had a hard time being able to see the interesting from the mundane. My editor saved me from producing a boring book. Don’t confuse editing with proofreading. A good professional proofreader is worth every penny, although their rates vary dramatically. I was fortunate enough to find a really good one (Marla Markman). Find an agent. Should take about 3 to 6 months. The agent will review your “Query Letter” (another entire project). Shouldn’t take them more than three months to get back to you to let you know if they even want a book proposal. I’m sorry, but if I had run my previous business like that, I wouldn’t be sitting here writing about my past successes. If you’re lucky enough to get an agent, they estimate a year to find a publisher willing to take your project…if they find you one. While I do know that publishers supposedly have the distribution down, in a world where distribution of books is no longer set in its ways, I decided to go alone and start my own publishing company. I didn’t have the time or patience to deal with a publishing house…even if they were interested. Let me be clear. I started my own publishing company, which is very different from having a book printed on demand (POD). Why? My book is hard cover and has color photo pages; both are very difficult for a POD company to produce price effectively. Buoy Press was born. Printing—One of the things a publisher does for you is print your book. Now I had to find a printer on my own. I got four quotes including one from China and was pleased to see the best quote and services I could find was right here in America. (BookMasters) While I wanted a local company, it seems that the Midwest is where books are printed, so the Midwest it is. My book designer helped with specifying size, paper, color, page layout, etc. because the printer speaks a different language that I do. Distribution—What good does it do to print a couple thousand books if you don’t know how to distribute them? Who is going to distribute them? How are they going to be circulated and to where? Online? Amazon? Barnes & Noble, others? Bookstores? Where will your books be stored, in your garage? Will you mail them out yourself? Remember your original purpose in writing the book. If it’s just a few hundred books that you want your friends and relatives to see, then you may want a garage full and spend time at the post office. I was looking for something much bigger because I want my name out there in the limelight in order to get known as a motivational speaker. Therefore, I wanted my book available in bookstores even though most books are bought online. I wanted to spend my time promoting, not shipping. I had to find a distributor who would handle a small publishing house such as my new company, Buoy Press. I found only a few distributors who would work with small publishers and settled on mine. (Atlas Books is a division of BookMasters) They store the books, ship the books, handle the Amazon account, distribute to Ingram, etc., and they allow me to have my own shopping cart with a direct link to their distribution. Promotion—Promotion used to be handled by the big publishing houses, but that has changed even if you get a contract. Why would they spend big bucks on an unheard of author? If you’re John Grisham or Tom Clancy, they know they have a sure thing, but spending promotion money and time on unproven authors is a thing of the past. Whether you go with a publishing house or publish the book yourself through either a printer or POD, you are the one responsible for promoting your book to the world. Be prepared to learn SEO (search engine optimization), have a website you can drive traffic to, get involved with Social Media such as Facebook, LinkedIn, Twitter, etc. I’ve been in newspaper articles, online blogs, and they’ve only just begun to scratch the surface of my guaranteed 10,000,000 views of something with my name in it. My book, The Boy Behind the Gate, has been a number one ranked book on Amazon.com for multiple days and the publicity is building. I’d call this a success. Next step is to figure out the speaking industry so I can get my inspirational message to those who want to make their dreams come true. Larry Jacobson’s terrific Author Website with movies and hundreds of photos from his journey. Take a look. Watch for a Case Study featuring the many interesting design elements in Larry’s book. Amazon links are affiliate links. Photo Copyright © 2011 Larry Jacobson. All rights reserved. Thanks for this article. All very useful information. I was particularly interested in the information concerning marketing and distribution. Brian, Once the book is written, then it’s all about the marketing and distribution, so it is indeed very important. Glad you found the info useful. Thank you for your wonderful words of wisdom about publishing. I am still writing my book. It is motivating knowing publishing options in advance. Glad the article has helped … don’t let the options overwhelm you, just keep them in mind as you write. I also recommend Joel’s new course on self-publishing which will guide you and that’s never to early to start. I’ve just published my first 2 YA/Adult urban fantasies on ebook & am wondering about print. I didn’t know there was such a thing as PPP companies, so thanks for that. Thanks for the comment. Feel free to call Marsha Friedman at EMSInc and tell her I sent you. They do great work. Great to see you here on Joel’s site! Thank you for reading my book! I can’t wait to read your book. I’m so impressed! You have always been a wonderful young man, and I’m so pleased to know you and your dear family. I appreciate your sharing the blog around. This was a frank and cogent article — particularly helpful given the rapid changes in the publishing industry. I hope it gets a lot of play. Thanks so much for the compliment. I wish you all the best with your book–it looks beautiful! Did you print in China since it’s all color? Ask for Mark Cook at EMSI. Wow! You just gave me more information in 5 minutes than I’ve gathered spending hours on the Internet! I self-published a book about Feng Shui in January and have been working my tail off going the social media route for PR, etc. I, too, had a vision of a quality product and my book was expensive to produce as it is full colour throughout. I went one step further and also created other merchandising opportunities with a poster and art cards using the photos I had commissioned for the project. I will certainly check out Atlas Books and EMSInc with hope they can help me with marketing. Self publishing is a labour of love but I honestly think this the way of the future, especially for non-fiction works which are not as ‘timeless’ as novels. In this day of instant gratification, who wants to wait 2 years for an agent and publisher to get back to you with an answer!? Thank you! What an absolutely fabulous post, Larry! We learn so much from the experiences of others. Thanks for sharing yours. Thank you Doreen, I’ll go and join that discussion! Thanks for this article, which generously details how much time and money can be put into writing a book. You do all potential authors a great service by doing this. I see the Amazon sales rank today (Mar 13) is 400,000+. I know what sales volume that usually means. Did the book rank higher in general sales rankings? ps: The bookstores in Provincetown would probably move this book at a decent clip. You’re more than welcome, and thank you for the response. The book was #1 on Amazon for more than 5 days in its category and sales are brisk. They raise and lower the price according to how well it’s doing and it’s fun to watch the price change as the word spreads about the book. The book is available to all bookstores through my distributor, Atlas Books. All the bookstore has to do is request it! I’d sure appreciate you walking in and giving them a suggestion! I wonder if you’re the famous guy who’s tweaking price to keep the book at the top of the category. Then when it’s up there, the price is raised. Brilliant. I only get out to Provincetown a couple times a year, when I’m visiting my storeroom mid-Cape. I bet you’d move a few hundred books in Provincetown this summer if you called the 3+ bookstores and told them about your book. If you can, schedule some readings. Nautical + gay = P-town. That’s absolutely not me. I have nothing to do with how Amazon prices the book. Retail is $27.95 and what they do after that is completely up to them. Thanks for the tip on P-town! Thank you for your comments. Isn’t it amazing how many people/companies there are who are willing to take your money and “hope for the best.” EMSInc is a great find. Contact for you is Mark Cook and of course, please tell him I sent you. I wish you all the best in your P.R. efforts. Yes, thank you. It appears that taking the time to write a good book is indeed paying off as people actually like it! Thanks so much for posting this. It’s one of the very few quality-focused self-publishing posts I’ve seen amongst the sea of “launch fast” opinions. While I’ve decided to go into self-publishing, my time and cash outlay is now approaching yours. I’m also going through my third content-focused edit… And will still have a line edit and a proofread. I’ve seen your book’s reviews; looks like your efforts are paying off well. Do you happen to have the EMSInc’s website address? My Google search turned out lots of companies, none of which is a PPP PR agency. Thank you! so much for your kind comments! There were plenty of temptations to go cheap and lose sight of my goals during the process. As there were plenty of reasons to not continue all the way around the world. I hope I can inspire others to maintain their integrity and keep sight of their own goals. I really appreciate your message and am always available for questions! WoW! I admire your guts – but not for the reasons you may think – although your sailing accomplishments ARE both amazing and most certainly noteworthy. 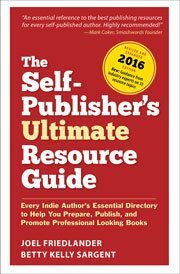 You are absolutely the first IndieAuthor who has publicly admitted how much a well done, well-crafted self published book can cost. $8,000 is a LOT of bread…I’ve come almost close to that in my obsession with ‘Jenkins’ but most importantly your comments about impeccable, professional editing and book design rings true with every single other [successful] author I’ve encountered e.g. Bill Dietrich, Zoe Winters, Boyd Morrison – across every genre and realm.